photo from Alaska's Digital Archives. ". . . other independent merchants in town had no desire whatsoever to deposit money in a bank run by their biggest competitor." Andrew Stevenson, an entrepreneur with financial roots in New York, recognized that Alaska was ripe for a system of branch banks including one in Anchorage. Stevenson selected an agent to establish a branch of the Bank of Alaska in Anchorage, a sometime medical doctor named Julius T. Westermann. In Westermann's eyes, Anchorage's best business man, and the one he wanted to work, with was A. A. Shonbeck. The situation was competitive, as another group was seeking to form the Bank of Anchorage at the same time, and the first bank to open would likely capture the bulk of the banking business. In 1916, Shonbeck constructed a little bank building for the Bank of Alaska (which later became the largest Alaskan bank - The National Bank of Alaska), and was an early, if not the first, depositor. Later Shonbeck became a director of the bank. "Art became the Ford dealer. . . selling Ford tractors and Ford cars. He was appointed agent for the Giant Powder Company so he sold dynamite out the backdoor, cabbage and cauliflower out the front door, Ford cars from the order desk, and Standard Oil gasoline and other products out of the side door." He also sold other necessary items for mining, such as carbide in 20# lots. In the early days, gasoline sold for 16 � cents per gallon. "With only his imagination and U.S. Army's pathfinding expedition from New York to Nome, [as guides] Arthur A. Shonbeck led the crusade." "Men whose hands had not been sullied by anything heavier than a pen for many years grappled the mattock and axe and shook the kinks out of their flabby muscles. Ladies with rakes . . . cleared away the small debris while others piled it upon the small mountain of stumps ready for the torch." The field was ready for Noel Wien's first flights a year later, and served as a landing field for bush pilots, with room for a nine-hole golf course. Shonbeck, with co-venturers Gus Gelles, Ike Bayless, and Oscar Anderson, then founded Anchorage's first airline business, the Alaska Air Transport Company. Two Travel AirTM airplanes, the Anchorage #1 and the Anchorage #2, arrived in eleven crates in Anchorage on March 1, 1927, and were quickly assembled. The new company hired Russel Merrill as chief pilot, and Alonzo Cope as mechanic. With Cope, who was always busy, Alaska Air Transport could usually keep one aircraft flying. Air transport to remote mines had always been part of Shonbeck's vision. Chief pilot Merrill was lost over Cook Inlet while on a supply run to a placer mine near Nyac, east of Bethel. The partners abandoned their flying business after Merrill's loss, but within a few years, Shonbeck was backing aviation again, this time (around 1932) as a director of Wesley Earl Dunkle's Star Airlines. 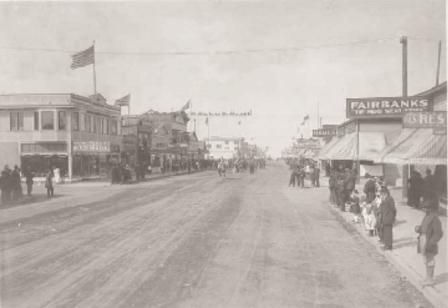 Lacking accommodations, Dunkle's young pilots, Mills, Ruttan, and Waterworth, moved into the Shonbeck Apartments as they provided instruction in the art of flying to the citizens of Anchorage, and flew scheduled flights to Dunkle's Lucky Shot Mine in the Willow Creek district. It was easy to convince Shonbeck that flying had arrived in Alaska, that it would become a necessity to the developing mining industry, and that it could be done with relative safety. Shonbeck was one of Anchorage's steadfast civic leaders. In 1923, he was elected to the city assembly (on which he served again in 1932). Shonbeck missed being elected mayor by four votes in 1924. He was a charter member, and sometime president, of the Anchorage Chamber of Commerce, a president of Igloo #15 of the Pioneers of Alaska, and a faithful member of the Benevolent and Protective Order of the Elks. Shonbeck was also a regent of the University of Alaska, serving for more than ten years, through the transition from the original Alaska Agricultural College and School of Mines, to the present day University of Alaska. Politically, Shonbeck was a Democrat, and during the 1930s, a Democratic National Committeeman. He strongly endorsed the Matanuska agricultural experiment. He had his own successful valley farm to point to - an effective endorsement of the experiment. Anna Shonbeck was also active civically, especially with Anchorage's Christian Science Church. Because the men of the congregation were absent so much of the time, the women oversaw the construction of a new church, with Anna often in the lead. In 1927, Shonbeck organized and served as a director in a newspaper venture, The Anchorage Times Publishing Company. As required by an Act of Congress of 1912, the company named its publisher as the company, and R. G. Southworth as editor (Anchorage Daily Times, April 26, 1927). Individuals owning more than 1% of the company included Shonbeck, Frank Reed, Barney Gottstein, 'Cap' Lathrop and several others. Later additions to the company structure included E. A. Rasmuson, and a new owner, Robert Atwood, in the 1930s. The Anchorage Daily Times served Anchorage and all of Alaska for decades. Gold mining in Alaska picked up with the advent of the Great Depression, because, in 1934, the price of gold increased from about $20 an ounce to $35 an ounce. Shonbeck sold heavy equipment, food stuffs, dynamite and fuel to the miners, while also becoming more active in hardrock and placer mines himself, usually in collaboration with Beaton or Dunkle. He was noted as a soft touch for miners who needed a grubstake. With support from Beaton, Shonbeck took over, and successfully operated, a rich placer mine at Ganes Creek in the Innoko district west of the City of McGrath. In the early 1940s, Shonbeck added E.A. Rasmuson as a partner in a bucket line dredge operation. Shonbeck's businesses backed Wesley Dunkle's ventures at Golden Horn, Flat, and Slippery Creek (now deep in Denali National Park), as well as at the Golden Zone Mine. The Golden Horn project, in the Iditarod district, began as a Joint Venture with Pardners Mines of New York, who had backed Wesley Dunkle at the Lucky Shot Mine. Although the project failed in the end, it did produce some spectacular ore. Shonbeck earned some return on capital through his role as a supplier of Standard Oil products and Giant blasting agents to the project. The Slippery Project involved some of the most complex logistics of any of Dunkle's projects, and needed the support of Star Airlines, another venture on which both Dunkle and Shonbeck were directors. To get to the remote Slippery project, Dunkle and his pilot-mechanic, A. Aho, disassembled a bulldozer and flew it piece by piece from Golden Zone over the Alaska Range to Slippery Creek. Shonbeck was the dealer for the Allis-Chalmers line as well as for Caterpillar. Many thought that the project had merit as a viable gold prospect, and it had early support from Reno Sales of Anaconda, but it failed in the end, at least in part because of the refractory nature of the ore, which could be traced for miles along the Alaska Range. Shonbeck's involvement at Golden Zone was extensive and critical. He sold equipment and supplies to Golden Zone, he was a shareholder, with both common and preferred shares, and he was a member of the Board of Directors of Golden Zone Mine, Inc. 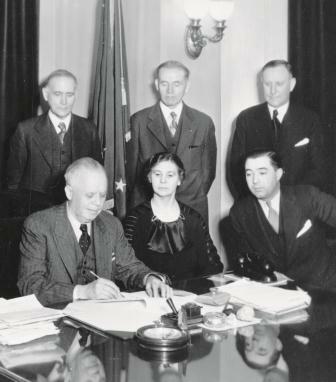 Furthermore, Shonbeck shared membership in Dunkle's 'kitchen cabinet' with other movers and shakers of Anchorage, including attorney Warren Cuddy, banker E.R. Tarwater, Alex McDonald, agent of Alaska Steam, and Anchorage-Seattle equipment dealer and placer miner Glenn Carrington, another Dunkle partner. Golden Zone began production with a scaled down mill in early 1941, and operated until about February, 1942. During the waning days of World War II, the project was optioned by St. Eugene, a subsidiary of Ventures Ltd., whose president, Thayer Lindsley, was one of the Twentieth Century's most prominent mine developers. There were, however, both internal and external problems with the mine. The National Bank of Alaska held a note on most of the equipment, and wanted an early payback. Dunkle wanted to get the mine opened as quickly as possible. In complex negotiations, Shonbeck was the only person who had the financial muscle to stand up to the bank and maintain Dunkle's position. The project ultimately failed because of World War II inflation and a fixed price for gold, but Shonbeck proved to be an independent partner and supporter. "It will be a pleasure bringing patients here from far corners of Alaska." In June 1945, Shonbeck and Beaton were in the Innoko district, working on plans to renew placer mining operations at Ganes Creek. On the way to the property, their truck struck a bridge abutment, and careened into a six foot deep creek. The two men were trapped and drowned. Shonbeck was a man of action. He provided services, equipment, transportation, financing, and hands-on mining experience to Alaska's mining industry. He was a true civic worker and leader. He proudly thought of himself as a mine owner and operator. "Shonbeck was, I am told, the first customer the bank had in Anchorage and when I took over he was the endorser of about one-third of all the notes in Anchorage. He was trustworthy and loyal. He was never small." ". . . envisioned a bright new future for the Territory . . . . That indomitable spirit can be seen threading its way through the history of Alaska's No. 1 city. Such individuals as A.A. Shonbeck, Ike Bayless, Frank Reed, Joe Conroy, Ray Larson, E.A. Rasmuson, "Cap" Lathrop, Zac Loussac, Tony Wendler, Charley Herron, Tony Dimond, James Wickersham, Tom Price, Bob Bragaw, Leopold David, and Oscar Gill kept Anchorage alive. They weathered the early storms which determined the town's destiny." A fitting tribute to one of Alaska's great men, who well deserves to be inducted into the Alaska Mining Hall of Fame Foundation. By Charles C. Hawley, October 2011. Atwood, Evangeline, Anchorage: All-American City. Binford and Morts, Portland, 1957; Includes references from text and appendices. Bagoy, John P., Legends and Legacies: Anchorage 1910-1935. John Bagoy, 2001. Cole, Terrence and Rasmuson, E. E., Banking on Alaska: The Story of the National Bank of Alaska, V.I, University of Alaska Press, 2000. Hawley, Charles Caldwell, Wesley Earl Dunkle: Alaska's Flying Miner. University of Alaska Press, 2006. Notes: Anna Shonbeck is sometimes given as Ann or Anne Shonbeck. I am indebted to Pencia Rose Beaton for her interest in Shonbeck, her grandfather's great friend, and for clippings and support documents on Shonbeck's relation to the Anchorage Times Publishing Company and Providence Hospital.